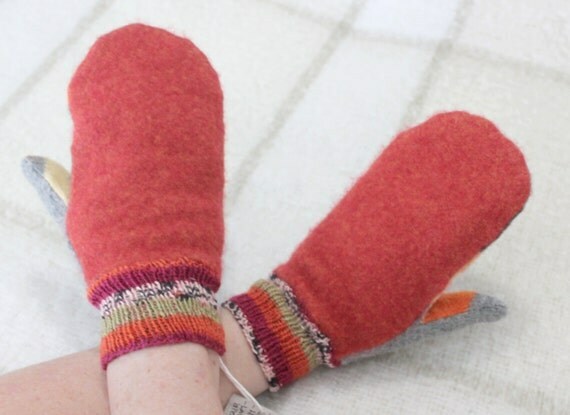 -This is a listing for a pair of red/grey harlequin Felted Sweater mittens with Hand Knitted wrists. -I have hand knitted the wrists myself for a more personal look. -These mittens have a beautiful gradient red/green and black yarn from one wrist to the other. -These mittens are one size and can be worn by both women an men with Small-medium hands. -My daughter has small hands and thinks they fit great. -My husband has medium hands for a 5'8" guy and thinks they are a bit tight on the width size cause he's a construction worker so his hands are kind of big but for someone with normal hands they fit well in the Med, size. -They're perfect for a winter walk, building a snowman, or any other outdoor activity. --I personally own a pair and can tell you that they are very warm. I live in Quebec, Canada where winters are very cold. -Can be worn by men also. -If you need to wash your mittens, simply toss in the washer with like colors and dry as you would any other mittens. *Shipping to Canada sometimes might seem high, but I am in Quebec. So when I ship elsewhere of Quebec and Ontario, it costs me double the rate then Regional. So I write the price for outside which is the price that is given to me in the new Postal Canada rates booklet. If you are from Quebec or Ontario, do not worry, I refund any over shipping charges through Paypal within 24 hours. Or send me your postal code and I will check on the Net and send you a more accurate price.